Amalia Mejia is the CSAC Results First Program Coordinator. To assist county leaders in their efforts to provide high-quality criminal justice programs that are cost-effective and results driven, the CSAC Support Hub for Criminal Justice Programming offers a spectrum of services to support county leaders in their decision making process and assessment of local systems in addition to criminal justice programs. Through the use of research and analytics, counties can better assess their criminal justice program performance, cost-effectiveness, and results. County administrators, probation officers, as well as other public safety and behavioral health representatives from 10 counties across California attended the annual CSAC-Results First summit in Santa Cruz County this week to collaborate on evidence-based policymaking strategies. CSAC’s Administration of Justice Policy Committee meeting will be held during the CSAC Annual Meeting on Thursday, November 30, from 9:00 a.m. to 10:30 am at the Sacramento Convention Center, Room 314. The agenda and associated materials for the upcoming CSAC Administration of Justice Policy Committee can be found here. The Substance Abuse and Mental Health Services Administration’s (SAMHSA) GAINS Center is currently soliciting applications from communities interested in developing integrated strategies to better identify and respond to the needs of adults with co-occuring mental and substance use disorders in contact with the criminal justice system. The Forensic Mental Health Association of California [FMHAC] will present Words to Deeds XI and the Paradigm Awards next month with the overall goal of reducing the number of individuals with mental illness involved with the criminal justice system. The Conference will highlight the Mental Health Services Oversight and Accountability Commission Criminal Justice Project Report, provide a forum to share best practice programs and expand conversations that generate action and improve outcomes. In an effort to change tactics in the “war on crime,” California has undertaken numerous strategies to amend the broken criminal justice system. Like many others, I have found it appalling to witness so many individuals fall into a perpetual cycle of recidivism that impacts the entire family and community. But in a relatively short period of time, we have witnessed changes in the criminal justice system as a result of 2011 Public Safety Realignment, Proposition 47 and Proposition 57. Governor Jerry Brown has reappointed three members of the Board of State and Community Corrections (BSCC) to new three-year terms. They are: Francine Tournour, Director of the City of Sacramento Office of Public Safety Accountability; Michael Ertola, Nevada County Chief Probation Officer and Lassen County Sheriff Dean Growden. For additional information please see the Governor’s press release. The public comment period officially opened July 14 for Proposition 57 regulations. California voters passed Prop. 57 last year to enhance public safety by emphasizing offender rehabilitation and preventing federal courts from releasing inmates. It includes an increase in credit-earning opportunities for participating in in-prison programs and activities, as well as parole consideration for nonviolent offenders. The California Governor’s Office of Emergency Services (Cal OES), Victim Services and Public Safety (VSPS) Branch, will be hosting a FREE webinar on Tuesday, July 18, 2017, from 1:00 – 2:30 p.m. The purpose of the webinar is to provide an overview of the competitive Request for Proposal (RFP) process related to state and federally funded programs Cal OES administers. Additionally, the webinar will cover the required components of a Cal OES VSPS grant proposal. The Stepping Up partners will host a webinar on June 29, from 11:00 am to 12:15 pm, on Conducting a Comprehensive Process Analysis and Inventory of Services for People with Mental Illnesses in Jails. The webinar will feature key strategies for conducting a comprehensive process analysis and inventory of services for people with mental illnesses in local detention facilities. The Board of State and Community Corrections (BSCC) approved SB 844 Local Detention Facility Construction grant awards totaling $270M to nine counties. The state lease-revenue bond financing established in the Governors 16-17 budget and SB 844, was earmarked for the 20 counties that have not yet received jail improvement funding or that received partial funding. CSAC and the Pew-MacArthur Results First Initiative kicked-off the Ventura County partnership on June 8th. The Chief Probation Officer Mark Varela and County Executive Officer Michael Powers made opening remarks encouraging their staff to embark on this journey that will help them use evidenced-based practices that are cost-beneficial to their county. SB 630 (Skinner) – Jails: Financing Bonds. The Solano County Board of Supervisors voted unanimously this week to join the CSAC-Results First partnership to create a baseline for their criminal justice programs and engage in evidenced-based practices. CSAC partnered with The Pew-MacArthur Results First Initiative in 2015 in an effort to support county leaders as they engage in evidence-based policy making that seeks to invest in programs that will produce the best outcomes for residents and the highest rate of return on the counties’ investments. The Board of State and Community Corrections (BSCC) will meet next week to consider a variety of issues–including whether to accept recommendations from the BSCC Proposition 47 Executive Steering Committee. That committee is charged with ranking Prop 47 proposals and it made its final recommendations this week on May 30. The Nevada County Board of Supervisors voted unanimously to join the CSAC-Results First partnership to engage in evidenced-based practices. CSAC partnered with The Pew-MacArthur Results First Initiative in 2015. The Pew-MacArthur Results First Initiative is a joint project of The Pew Charitable Trusts and the John D. and Catherine T. MacArthur Foundation. It is a capacity-building initiative to provide jurisdictions with tools to make informed, data-driven decisions. The California Department of Corrections and Rehabilitation (CDCR) recently released general updates to the Proposition 57 emergency regulations. These regulations are temporary and will remain so for 160 days from the date of approval. Also, CDCR may file up to two 90 day extensions as needed and expects a public comment period will take place for a minimum of 45 days. The Administration of Justice Policy Committee held an informational meeting on bail reform in California, hearing presentations from Senator Bob Hertzberg and Assembly Member Rob Bonta focused on their bail reform proposals – SB 10 and AB 42. The National Association of Counties (NACo) Stepping Up Initiative partners will host a webinar on establishing baseline data for mentally ill jail populations next week. The webinar, Thursday, May 11 at 11:00 a.m., will feature key strategies for establishing baseline data as well as highlight where some of the best opportunities exist to reduce mentally ill jail populations and provide measurable benchmarks of progress. The Board of State and Community Corrections (BSCC) Proposition 47 Executive Steering Committee (ESC) will meet on March 29 from 9:30 am – 5:00 pm at BSCC headquarters in Sacramento to go over the Proposition 47 proposal rater training requirements. For a copy of the agenda and additional details please click here. Interested in learning about what works in criminal justice? 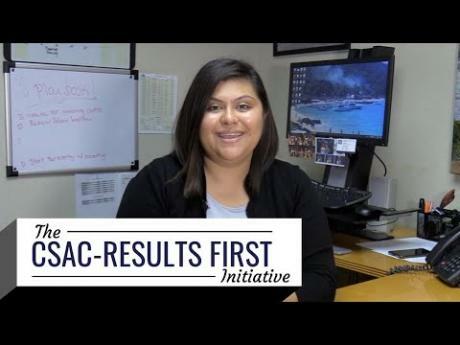 CSAC has partnered with The Pew-MacArthur Results First Initiative to help California counties understand evidence-based practices to reduce recidivism and achieve more positive outcomes in the criminal justice system. The Council on Mentally Ill Offenders (COMIO) is hosting the Protecting California’s Investments in Medi-Cal Expansion for the Justice-Involved Workshop on February 1st. The workshop aims to evaluate the current importance of how expanding Medi-Cal eligibility has assisted in ensuring that the behavioral health needs of the criminal justice population are met. COMIO intends to take the information and ideas shared in this workshop, conduct follow-up information gathering, and develop a written brief. The California Department of Insurance will meet from 9:00 am – 12:00 pm in San Francisco on January 31st to examine California’s current bail system. Over the last few years bail reform has become one of the biggest issues nationwide and in California the state Legislature has been focused on finding alternatives to the current system. Public notice has been posted on the BSCC’s website. The Judicial Council will consider amending the California Rules of Court to standardize and improve court procedures―and notice of those procedures―to defendants in infraction cases at its public meeting on Friday, December 16 in Sacramento. The National Association of Counties (NACo) is hosting a webinar December 15, 12:00 pm – 1:30 pm PST that will provide an overview of the recommendations of the NACo-NLC Opioid Epidemic task force. Additionally the webinar will invite comments and questions from local officials from across the country who are working to address the opioid crisis in their communities. The CSAC Administration of Justice policy committee met on December 1 at the 122nd CSAC Annual meeting in Riverside County. Supervisor John Viegas, Glenn County and Supervisor Virginia Bass, Humboldt County, presided as Chair and Vice-Chair respectively. The meeting agenda and attachments are available here. The California Governor’s Office of Emergency Services (Cal OES), Victim Services and Public Safety Branch announces the release of the Human Trafficking Victim Assistance (HV) Program Request for Proposals (RFP). The HV Program is designed to provide one-time funding to victim service providers to assist human trafficking victims with trauma recovery and provide services that include emergency shelter, temporary housing, counseling, transportation and legal assistance. The Ventura County Board of Supervisors voted unanimously this week to join the CSAC-Pew MacArthur Results First Initiative, a joint project with CSAC and the Pew Charitable Trusts and the John D. and Catherine T. MacArthur Foundation. It is a capacity building initiative to provide counties with tools and information to make informed data-driven decisions whether in criminal justice, juvenile justice or behavioral health areas. During its most recent public meeting, the Judicial Council heard, considered, or took action on a variety of issues relative to the administration of justice. Many of them have direct impact on counties. The Board of State and Community Corrections (BSCC) is holding its next SB 844 Financing for Adult Criminal Justice Facilities Executive Steering Committee meeting on Thursday, November 10. The meeting will be held at the BSCC headquarters starting at 9:00 am. Fifty California counties will receive nearly $16.9 million in State Criminal Alien Assistance Program (SCAAP) awards this year, with the State of California receiving nearly $50.6 million. California’s combined total represents roughly 37 percent of the $189 million that was made available for SCAAP. The Bureau of Justice Assistance announce the allocations this week.